What do you get when you mix 1/5 of a British boy band, live poultry, a fish and chip shop and some school children from St Albans? You get the 2018 Gucci Men’s Tailoring campaign! That’s right, Harry Styles has fully transformed from an X Factor hopeful and tween heartthrob into a bona fide rock star and fashion icon. Harry’s Gucci-filled makeover has turned this 24-year-old into one of the most-watched men in fashion. He’s bringing back a romantic sparkle of menswear in the shape of florals and flares. Being the face of the Italian fashion house is a first for Harry, but Style is in his name – literally. 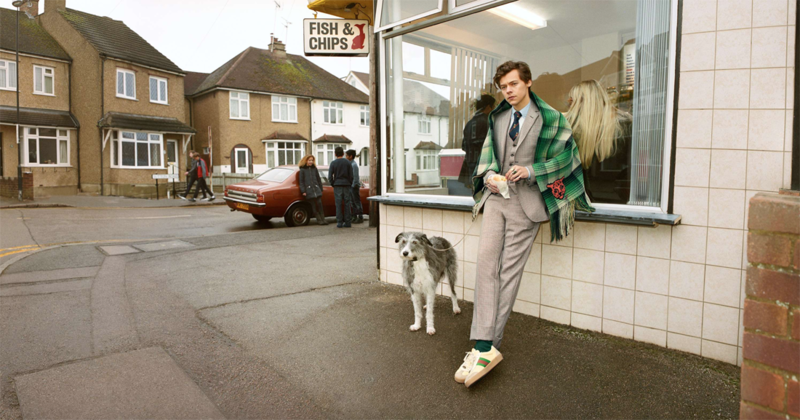 So why not get the young man strutting his stuff in a North London chippy wearing some very nice clobber? Glen Luchford photographed the campaign and he gave us everything we could possibly want and a bag of scraps on top! Dressing well shouldn’t just be for formal occasions – if you can wear a suit to a formal dinner, you can wear a suit to the chippy. 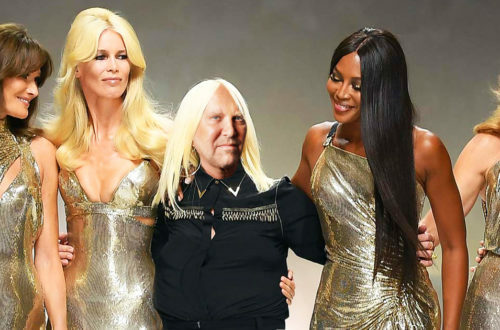 Never feel overdressed. 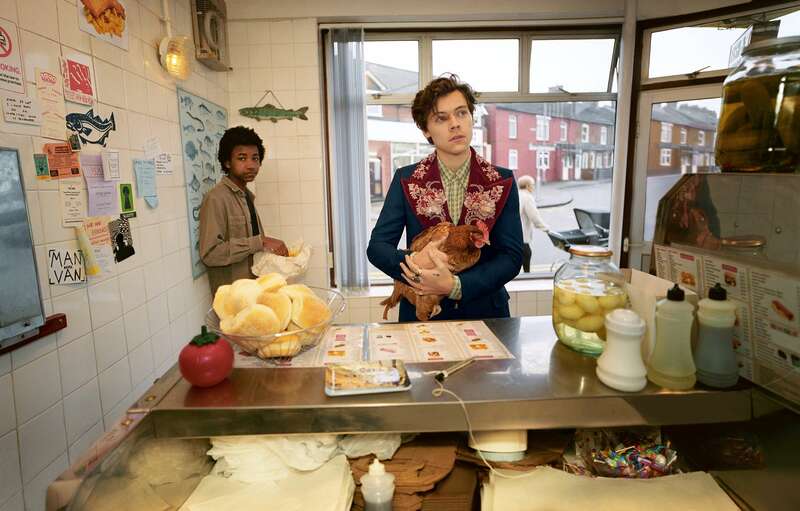 But it’s not just Mr. Styles who’s the star of the show, the scruffy pups and live poultry all add to the essence of Englishness. Gucci’s aesthetic at the moment is something I’m FULLY on board with. I love the nod to the seventies, with large lapels and leather loafers, it’s a gorgeous throwback to a time when people did the hustle instead of twerked. And of course, it wouldn’t be Gucci without some ostentatious embellishment. I have to admit, I love the pure Britishness of this campaign and the fashion film. I think the music, the clothes, and the location all play beautifully into the idyllic lifestyle Gucci wants to put out. For example, when you ask an American what they think of when you ask them about British culture, I’m sure the first things that come to mind are; The Royal Family, drinking tea and fish & chips. 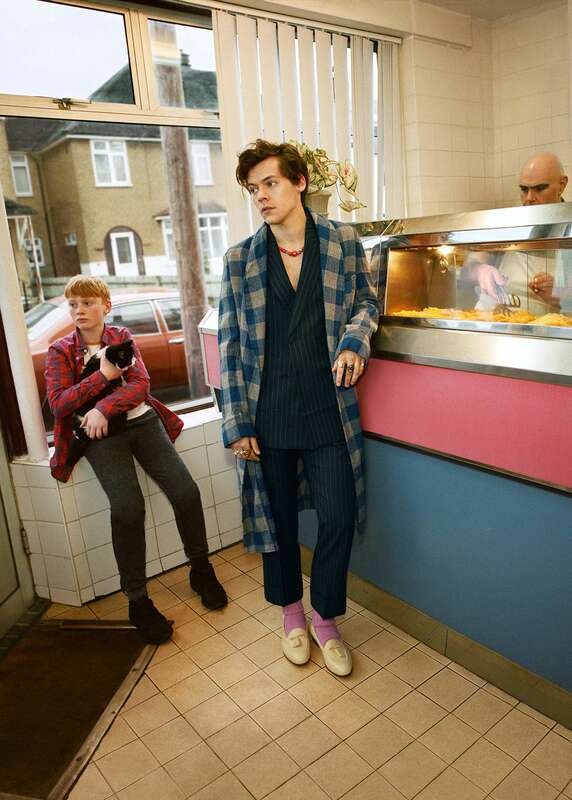 Make sure you check out the Gucci Men’s Tailoring campaign starring Harry Styles in the video below. It’s a fine mixture of bizarreness, charming Britishness and pure fashion. 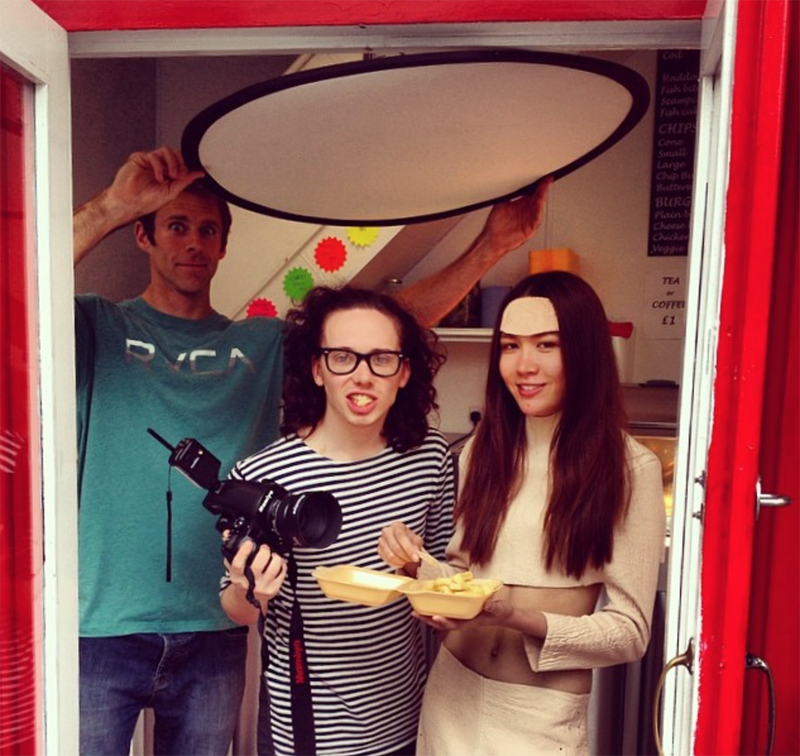 Maybe I’ve just got a thing for shooting inside of chippies? Now, maybe I’m a tad biased when it comes to my appreciation of this campaign. Why? Well, I did something quite similar when I was studying Fashion Photography at Falmouth University. One of my shoots for my Urban Youth project was called ‘Big Shop‘. The theme was wearing ‘out there’ outfits while running your mundane daily errands – buying fruit and veg, doing the laundry or having a pint in the pub. One of the locations I chose to shoot in was the Cod On The Corner fish and chip shop in Falmouth. 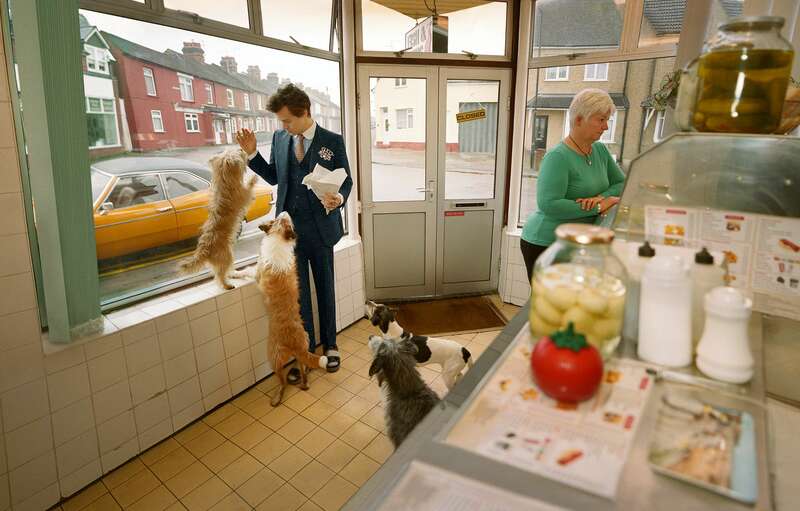 This was one of my favorite Cornish chippies while studying down south, especially because of the retro interior. That, and that it stayed open after the clubs shut. I chose this location based on its retro feel and the outfit made by Jacob Stevens reminded me of battered cod.